Hair Tattoos Dare You to Get Tatted! Hair tattoos may be the next biggest craze in wild hairstyles. People are getting them done for reasons similar to why they’d get a real tattoo, only these are definitely not permanent. With hair tattoos, you can have a design shaven into your hair in honor or memory of someone or just because you feel like it! Hair tattoos, as the name would imply, are in the hair. Think of them as something like a stencil etched into the hair to create a design. This design craze seems to be for all age groups. In fact, one of the authors of Mouse for Less let her sons get Mickey Mouse designs on their heads as part of their “hidden Mickey haircuts.” Most hair tattoo designs range from random geometric patterns and mazes to meaningful designs and tribal patterns. The stylist will start by outlining a design, then he or she will “chip” away into the design while fading it in certain parts to give it depth. Hair tattoos are generally done by men who primarily do men’s hair — but there’s no “rule” that says this is how it must be done. Who is Getting Hair Tatoos? Usually guys have hair tattoos, since you have to be willing to have your hair practically all shaven. Some guys also like to compliment their Mohawk with a hair tattoo, and some punk girls with buzz cuts or Mohawks seem to like them as well. Heck, we think this is an AWESOME way to add some excitement to a TWA or big chop! After all, women took the pants trend from men, and rocked it, so why not do the same with hair tattoos? The popular Indian tattooing dye, Henna, is also great for your hair! Are you nervous about taking the plunge to almost all-shaven, but still loving the tatted head look? 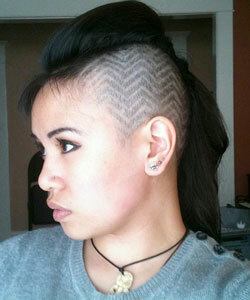 If so, check out some hair stencils! They’ll give you amazing hair designs — some that you can only get if you do stencils — but they don’t require that you get a buzz cut. What’s more, you don’t have to go to the salons for hair stencils! Just get some stencils (you’ll want some that will work with the contours of your head), spray, and you’re done! It’s pretty much like stencils you do on the wall or any other wooden project. You’ll want to do quick bursts of paint, so you can have more control over where it goes, and you can dab at it after you peel the stencil away and want to do touch-ups.